A long-term study on the effect of different crop rotations [soybean/wheat, S/W; maize/wheat, M/W or cotton/wheat, C/W] and tillage regimes [no-tillage (NT) or conventional tillage (CT)] on microbial biomass and other soil properties is reported. The experiment was established in 1976 in southern Brazil as a split-plot experimental design in three replications. Soil samples were taken in 1997 and 1998 at 0- to 5-, 5- to 10- and 10- to 20-cm depths and evaluated for microbial biomass C, N, P and S by direct extraction methods. The NT system showed increases of 103%, 54%, 36%, and 44% for microbial biomass C, N, P, and Cmic:Corg percentage, respectively at the 0- to 5-cm depth. NT systems also increased the C to N:S:P ratios. 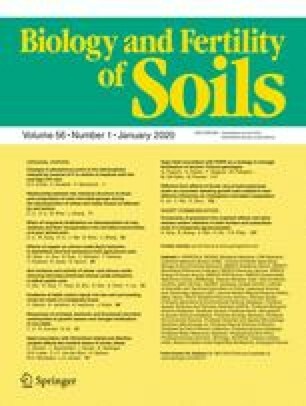 These results provide evidence that tillage or crop rotation affect microbial immobilization of soil nutrients. The larger amount of C immobilized in microbial biomass suggests that soil organic matter under NT systems provides higher levels of more labile C than CT systems.